In many ways, it’s an innovative work that you wish would not be that maddeningly opaque with you. 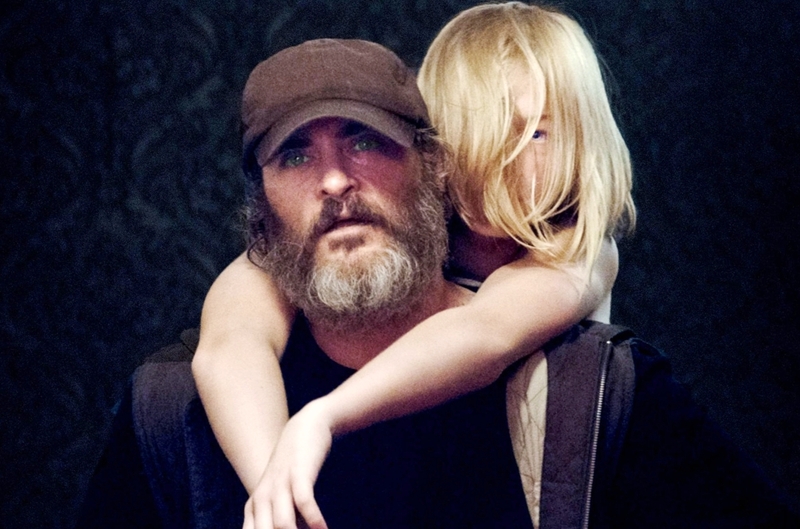 You Were Never Really Here features Joaquin Phoenix in an outstanding performance as a very dangerous character, yet the film prides itself in being short on context at various instances. For awhile, that works in the same way that a major classic like “Le Samourai” (1967, France) worked – by giving us a mysterious character, keeping us in the dark and the character in the dark, in order to let us figure out the who, what, why along the way. Lynne Ramsay is one of the most best and most experimental of female filmmakers in the world today. In eighteen years, there have been only four credits by her (“Ratcatcher,” “Morvern Collar,” “We Need to Talk About Kevin,” and this new one), which are all worth seeing if you are an arty connoisseur. I got the big picture of “You Were Never Really Here,” was moved by Phoenix’s self-torment, but I am not confident on all of the film’s details. I was enraptured anyway. The beginning scene shows Joe (Phoenix’s character) collect some precious materials in a baggie, and dumping blood and a little bit of vague flesh into a toilet he flushes down. He seems to need to exit the motel and stay out of sight. He randomly gets attacked by a mugger when he goes out a dark alley, but the mugger chose the wrong person to mess with. The mugger is clocked with one punch. Phoenix’s Joe is a hulky and brutal, even feral animal of a man, with a scraggly beard and haggard dark clothes – at all times he’s a phantom. He’s also a man impervious to pain. He often suffocates himself to death in his suicidal fantasies, but coming back into consciousness he is unaffected and goes about his business. Nothing hurts Joe. Except some very dark memories that come at us in a flash seem to hurt Joe on the inside. He has Middle East war experience, he has childhood trauma where it appears his father was abusive, he had things gone wrong in his FBI experience – and all of this is shown in fragments, in the vaguest of details. Ramsay could move the camera to reveal more, but that would take it out of Joe’s remembered point of view. A termination is attempted on Joe and everybody he knows. This of course riles up Joe, and Joe exacts revenge by walking up to every assailant and dispatching them as fiercely and quickly as possible. This vengeance is all done by Joe with no fear. “You Were Never Really Here” won Best Actor and Best Screenplay at last year’s Cannes Film Festival, yet it is not going to break any box office records. Why should you see this film that’s this tricky and obscure? I’ll give you three reasons. 1. Scottish-born Lynne Ramsay is one of the most daring filmmakers of our time and we need to support female filmmakers, right? She’s very arty, but there’s genius in every one of her works. 2. You may not understand the more hazy and cryptic shots, especially the more fragmented moments in the flashbacks, but the upside is that while most movies are forgotten an hour later, you will still be trying to piece this one together a month from now. Being short on context might be one of the film’s strengths after all. 3. Joaquin Phoenix with his most intensely method-y performance yet is a haunting tragic figure who is both savior and loner in self-made isolation, and you will never forget him. Phoenix really is that amazing. When he has a nervous breakdown scene, he has a certain way of trying to put that emotion back into the bottle and put a lid on it. The ending proposes that maybe Joe might become more like “Leon: The Professional” but I’m not sure of that. The self-made isolation thing is what makes me doubt that. I’ll give you a fourth reason to see this movie: A film like “You Were Never Really Here” is one where you don’t really know what you’re going to get since it’s unlike any other film. Film Cousins: “Taxi Driver” (1976); “Light Sleeper” (1994); “Ghost Dog: The Way of the Samurai” (2000); “We Need to Talk About Kevin” (2011).